M has a sweet tooth…even when he’s sick apparently! 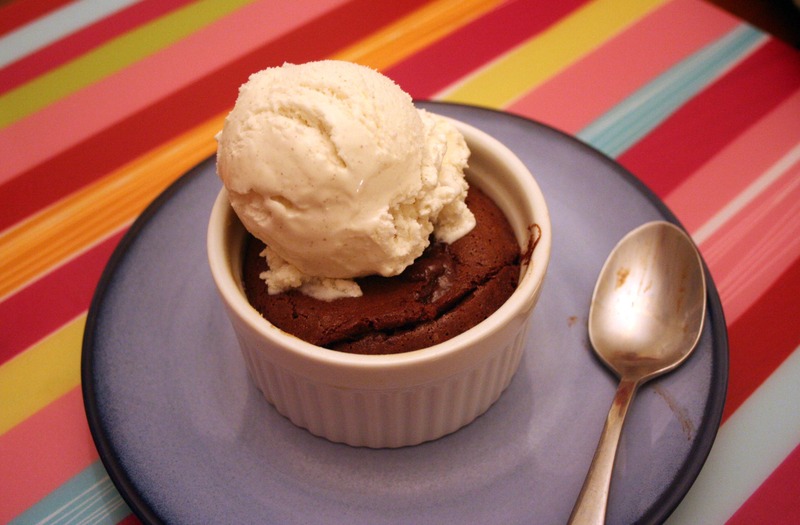 ;o) It’s okay though because this dessert is so quick to mix together, then it only takes a measly 12 minutes to bake! I also appreciated that the recipe only makes four – 6 ounce ramekins worth – I only have four of them, perfect! I know what I’ll be making him for Valentine’s Day dessert at least – now I just have to figure out what the main course is. Thanks for reading, enjoy! Preheat the oven to 450 degrees F. Grease and flour 4 (6-ounce) ramekins or baking dishes with the 1 1/2 teaspoons of butter and 1 teaspoon of flour in each, tapping out the excess flour. Set on a baking sheet. In a double boiler, or a metal bowl set over a pan of simmering water, melt the remaining 1/4 pound of butter with the chocolate, cream, and powdered sugar, stirring until smooth. Remove from the heat. In a bowl, whisk together the eggs, egg yolks, sugar, vanilla, and salt until thick ribbons form, about 3 minutes. Sift 2 tablespoons flour into the egg mixture and fold together. Fold the chocolate into the egg mixture. Divide among the prepared dishes and bake until the sides of the cake are set and the tops are puffed but still soft, about 12 minutes. 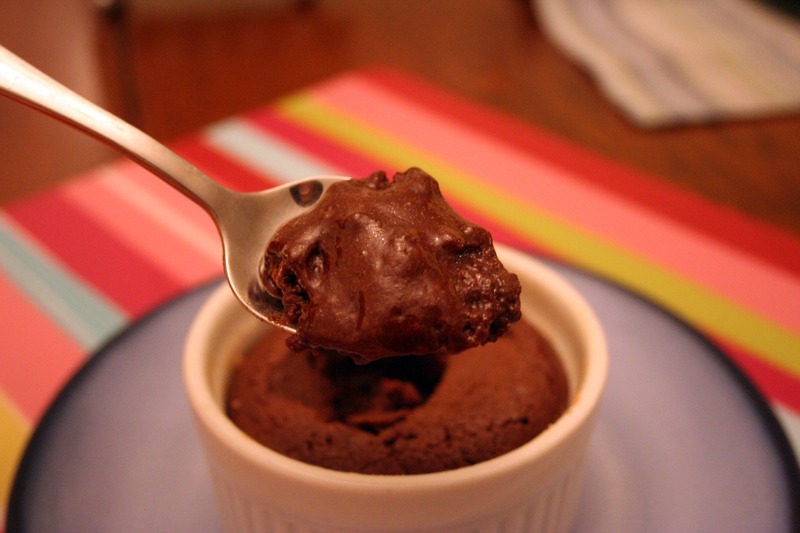 Remove from the oven and let cool in the ramekins for 2 minutes, then unmold onto dessert plates.